I had started to notice constant black circles under my eyes from my mascara. No matter how much I washed (and reluctantly scrubbed), it seemed to always be there. I mentioned to a friend this was happening and asked what she used. Then realized, I have stuff to make my own natural eye makeup remover at home! This post contains affiliate links. I love to share my favorite finds, and all opinions are always mine. I immediately came home, did some internet research, and whipped up a batch of this natural makeup remover! I had all of the ingredients at home. It works great, is moisturizing…and smells fantastic! Place in glass spray bottle and…Viola! Your own DIY natural makeup remover. Make sure you shake before each use to mix the ingredients. You may notice an immediate breakout when changing up your cleansing routine. In the long run, it will be worth it. I immediately noticed the dirt and oil clogging my pores coming to the surface. I also noticed a new glow to my skin. You may substitute distilled water (or boil water and let it cool) in place of the rose water. This will also reduce the cost of this already inexpensive makeup remover. It always seems costly to make your own natural cosmetics upfront, but there are so many other ways that you can use these ingredients. 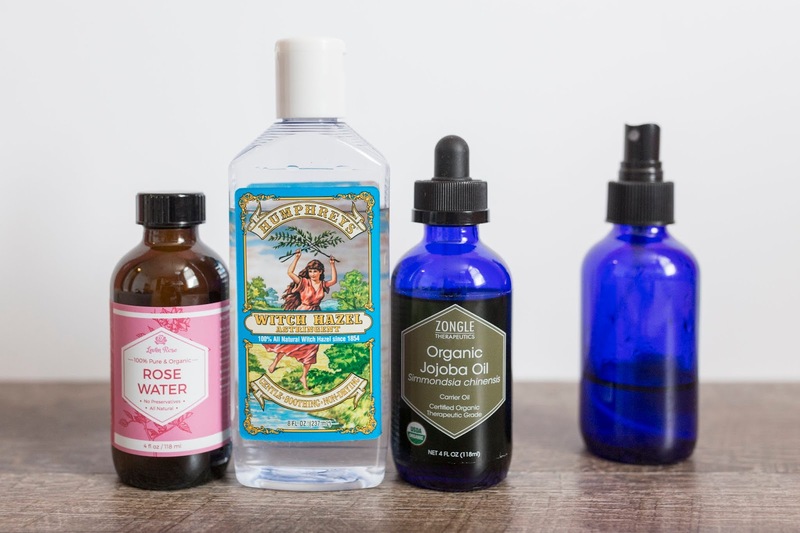 I use the rose water as a toner after I cleanse and exfoliate, and to spray on top of my makeup for that fresh look. I have also created my own anti-aging serum using the jojoba oil (look for a future post containing this recipe). Both of these products have so many benefits for your skin! I was using regular disposable cotton rounds to clean my face, then noticed exactly how many I was using (and how wasteful this seemed). I immediately headed to Amazon and ordered some reusable makeup remover pads. This also prompted me to think about all of the other wasteful everyday things I need to replace with reusable items. I filled my Amazon wishlist and can’t wait to share that with you next week! I can't wait to hear about how much you love your new DIY natural makeup remover!